MELISMATIC: NOW KPOPPING: MBLAQ Declares "War"
NOW KPOPPING: MBLAQ Declares "War"
If you told me in early 2010 I would become blackhole obsessed with not just one, but two stellar cuts by South Korean boy band five-piece MBLAQ (part of the last generation of Korea's boy bands that are actually around my age -- sob! ), I would have told you you were crazy. 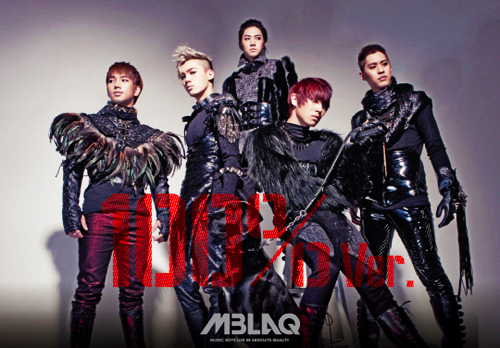 Sure, on paper, MBLAQ looks like a stellar troupe to beat. They have capable vocalists (who sound just as good live as they do on their recordings -- very important), tight dance moves, and were mentored by an insignificant solo artist you might have heard of called Rain (insert Mel fanning herself here). But in reality, in a genre that's literally stuffed to the gills with prominent and well-produced boy bands, their debut single "Oh Yeah" just didn't stand out to my ears (the entire hook: "Oh Yeah!/Oh Yeah!/Oh Yeah Yeah Yeah! ", in English). Fast forward to now. 2011 was already pretty good to the Music Boys In Absolute Quality, thanks to the little latin-twinged gem "Mona Lisa", which literally grabbed both my shoulders, shook me, and said, "Hey, we deserve your attention." But it proved to be just the appetizer to the main course -- as MBLAQ has officially declared 2012 their year, via their most recent mini album release, 100% Ver. The entire record is produced by Chance of One Way, including the string- and piano-assisted, swoony and rightfully intense dance ballad "This Is War." The song is a symbolic statement and in my opinion, it could just be the spark MBLAQ needs. The lyrics for "This Is War" depict a love triangle between two of MBLAQ's members over the same girl (gasp! ), declaring the two's friendship is over with the chorus ("You coward/You, who messed with my love/It's war!"). Chance seems to have a real penchant for this theme (perhaps it's inspired by his own personal life?). The theme of the song allows the group to be super macho and possessive in all of its fangirl-melting glory (part of the rap in the second verse: "Will you please shut your dirty mouth?/I will give back these painful tears to you/Engrave this in your ear/I will never leave you alone!"). Considering how I spend so much of my KPOP-ping listening to high energy, super synthy, AutoTuned club cuts (see 2NE1 and the majority of SM Entertainment's recent catalog), "This Is War" is a small breath of fresh air. It's imposing without throwing everything plus the kitchen sink into the production, and is another prime example toward One Way's skills. The choreography is stellar, the hook walks the balance of vulnerable and tough, and all five members vocals are on point, especially the falcetto toward the end and (I can't believe I'm writing this!) the rapping. "Oh Yeah!" indeed, MBLAQ. Well done.